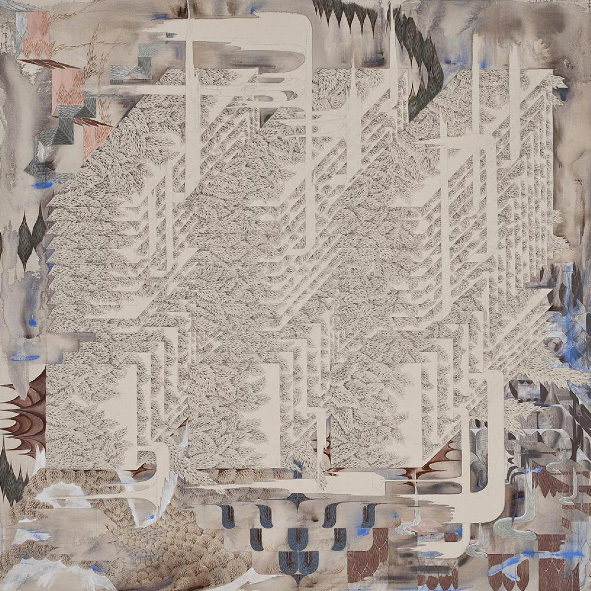 For all their natural connotations, the motifs used in Jeong's paintings are often combined and structured into architectural and geometric forms. Leaf-like marks form sweeping domes and arches in one composition, only to define linear architectural planes in the next. The marks are mere components in a fluid visual language, the building blocks of endless indefinite forms. For all the structures that can be identified in the paintings, there is always an ambiguity between the architectural and the natural. A dome may dissolve into what appears to be a river, vine, or valley, the regularity of a series of cubes disrupted by swirls and bursts of feathers, bushes, rushes, trees. Relationships between these elements in each composition culminate in a sense of endless potential growth; a boundless untouched utopia that will never descend into wilderness. Using video and kinetic sculptural work for the first time, Jeong pushes her practice into new territories. The dynamic sense of movement in her canvases is made literal in these works. The composition, drawn from the language of her paintings, is limited at first in the video, only to expand and 'grow' into full composition before our eyes. This video work allows a clearer understanding of the process behind Jeong's paintings. 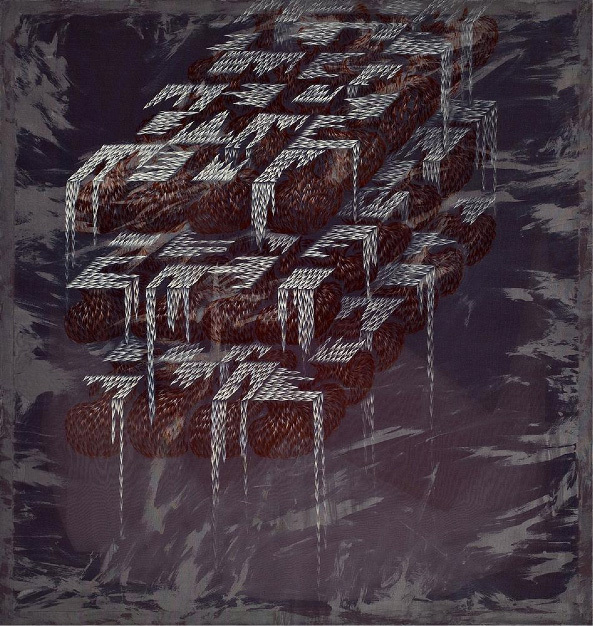 As organised layers appear gradually over one another in a digital environment, a simulation of her composition takes place. Standing at 2.2 meters tall the kinetic sculpture is something of a monument to the careful and complex ordering found in the structures of Jeong's paintings. She has long been interested in the use of ornament throughout human history, especially where it is used to augment architecture. In an endlessly repeating process, the sculpture lifts an ornamented industrial plate up from a bed of basic construction materials. Using electromagnetic charge, the plate caries these various elements to the apex of its movement only to release them. As the assorted articles fall slowly through the translucent shaft of the work numerous chance compositions and patterns are formed. Yun-Kyung Jeong is a graduate of Ewha University (Seoul), Slade School of Fine Art and Goldsmiths. Solo exhibitions include Axonometric, Sumarria Lunn, London (2011), The Song Am Culture Foundation/OCI Museum, Seoul (2010). 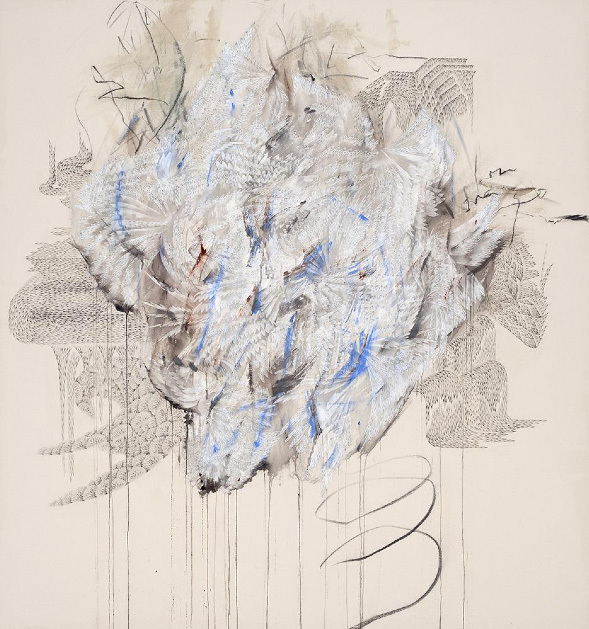 Groups shows include Facing Surfaces, Bosse & Baum, London (2013), Natural Perception, Aretha Campbell Fine Art/Narcissus Arts, London(2013), Personalized Memory, Gallery Hyundae, Seoul(2011), KIAF–Korea International Art Fair, with SUMARRIA LUNN//Hanmi Gallery, Seoul (2010), Invisible Bond, Korean Cultural Centre, London (2010), T-R-A-C-E, Shan Hyu Museum, China (2010), Natural Recurrence, SUMARRIA LUNN, London (2009), Long Nights, William Angel Gallery, London (2008), 4482:Korean Contemporary Art, London (2008), SFA Alsop Architecture, London (2007), MiKi, Gallery Cott, Seoul(2006) and Uterus, Space Achim, Seoul (2005). The artist was nominated for the Threadneedle Prize (2013) and is a recipient of the Renaissance Art Prize (2008) and the Foster Fletcher Prize (2008).